Domaine du Cheval Blanc is run by Denis Chaussi?. The vineyard has been in his family since the 18th Century; ten generations of winemakers have succeeded one another at the head of the family estate. This is the kind of history California just can't compete with. Located in the heart of the Entre-deux-Mers region, the property is southeast of the city of Bordeaux. It's on a popular tourist road, and many wine lovers have made the pilgrimage to the spot over the years. The terroir here is legendary for a reason. Millions of years ago, the area was underwater, which turned the soil below it into an extraordinary place to grow wine grapes. The clay and limestone lends a distinctive mineral quality to the wines that's like nowhere else on earth. And with nearly 300 years of experience growing grapes on this land, the Chaussi? family knows how to do it right. This wine was brought to us by Crus et Domaines de France (CDF), who represent many smaller Bordeaux producers. 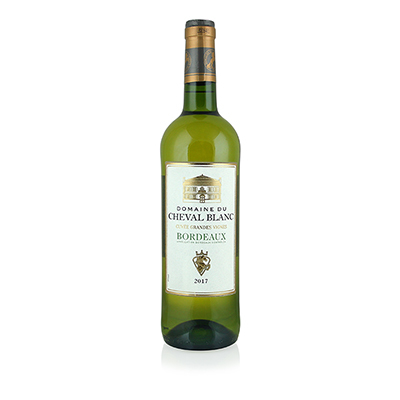 It's interesting to note that this is the only white Bordeaux in their portfolio. Obviously, what we have here is something special. Our selection is a blend of 60% S?millon and 40% Muscadelle, light and sparkling in the glass. As you lift it to your lips, you first notice the rocky soil nose, then tart stone fruit, lime zest and fig. This is followed by successive waves of spice, guava and gooseberry. It's a stunning series of sensations that unfold like a narrative. There's a rich history here, and it tastes incredible.